I’d been waiting for my first cruise invite for a while and wondering if I’d go or not because, although cruises are spectacularly popular, I just didn’t understand what the big deal was. Much as I love luxury getaways and spa breaks I secretly think real travel means crazy adventures and doing things the hard way. I thought cruises were for softies and people who were too afraid of travel. Regular readers will know that’s definitely not me. Also, although I love people I do not love crowds, so I was worried about floating around in a cruise ship with thousands of people. I’m also a big nature lover and a cruise ship is definitely a most unnatural environment. So I had a feeling that when a cruise invite came I wouldn’t go but life rarely turns out as expected. This wasn’t just any old cruise, it was the Queen Mary 2 for goodness sake! The biggest cruise ship ever to visit Australia and probably the most opulent too. This would be a chance to experience the best cruising has to offer. The Queen Mary 2 has formal and informal nights and we’d be there for a black and white ball so my dear husband Rich would have to wear a tuxedo and bow tie. This strongly appealed to all my James Bond fantasies. Mmmm. Please note if you don’t feel like getting dressed up you don’t have too although that also means you can’t go to the ball. That option was not presented to my Rich. We’d cruise out of Sydney so the chance to see one of the world’s most beautiful and famous harbors from one of the world’s biggest and flashiest liners was an opportunity not to be missed. Quick as a flash I found some very dear friends to look after the Candy kids for two nights and last week we flew down to Sydney to start our Queen Mary 2 mini cruise to Brisbane. So what’s the real deal about cruises and the Queen Mary 2? Well, let’s cover my fears first and talk about the other passengers. Were they big softies? Were they afraid of real travel? I tried my best and didn’t get to talk with every single passenger, but my general impression was that most people were on the cruise because, like me they wanted the Queen Mary 2 experience. They may or may not have slept rough, hitchhiked and lugged a backpack round the world in previous lives, but at this moment in time, they were enjoying being pampered on the Queen Mary 2 and frankly that seemed like a much better idea. As expected there were a lot of retired people on board but there was also a broad mix of ages and I saw a few kids, even though it was school term time. There were also people from all walks of life including guests in the most expensive staterooms with access to the Princess Grill restaurant which is out of bounds to other guests, and people who’d picked up their Queen Mary 2 cruise for a ridiculously low price at the last minute. I met some of the cashed up people from the posh staterooms in the Commodore Club and some of the last minute cruisers in the restaurant and on deck and they all seemed to be thoroughly enjoying themselves. Some guests, like us, were just on board for two nights, but others were spending 24 nights the Queen Mary 2 circumnavigating Australia. Which made me rather jealous, although it might have been pushing things to ask my friends to look after the Candy kids for that long. My fear of crowds was unfounded. Although there were crowds of people admiring the Queen Mary 2 in Sydney and queuing to get on board took 90 minutes, once we were all settled into our staterooms the ship didn’t feel crowded at all. It was people watching heaven because the Queen Mary 2 takes 2,620 guests and has 1,250 staff yet it felt spacious. There were plenty of free tables in restaurants and loungers on deck. There’s space for everyone on board with 1,310 staterooms, 17 decks, five swimming pools, and 10 restaurants. There are endless other places to hang out and activities to enjoy including the world’s only planetarium afloat, a cinema, theater, bars, shops, a massive spa, a gym and the largest ballroom at sea. The largest ballroom I’ve ever seen in fact. There are easily enough activities on the Queen Mary 2 to keep you happy for 24 nights including educational talks, trivia quizzes, exercise classes, dancing lessons, gambling in the casino and lots of sporty things like a putting green, quoits, shuffle board plus mini basketball and tennis courts. Despite all that I spent most of my time in the restaurants, on deck, in the fantastic spa and at the bar or nightclub. I can’t remember the last time I went to a night club but Rich and I can still bust a move or two. Finally through all of these experiences we were constantly surrounded by nature with amazing ocean views everywhere you looked. I was particularly taken by the sea view across the balcony from our king-size bed, and from my window seat in the Queens Room while enjoying afternoon tea served by smiling men in white gloves. They say that all good things are worth waiting for and the Queen Mary 2 certainly was. Even a short trip on board delivers the height of pleasure, both for discerning cruise lovers and for all you cruise virgins. 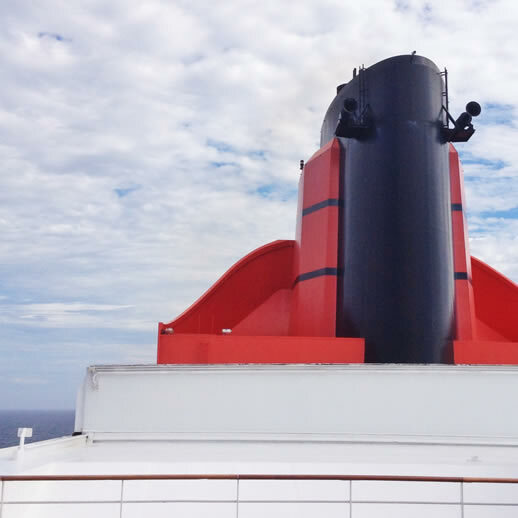 Want a second opinion on Cruising on the Queen Mary 2? Our co-cruisers Kerry Heaney, Lee Mylne and Christina Soong-Kroeger probably weren’t cruise virgins (as travel writing veterans they get around!) but they’ve written about their experiences on the Queen Mary 2 too. Check out A taste of cruising on Queen Mary 2, Coastal Cruising on the Queen Mary 2 and Queen Mary 2 for their sensational stories and fabulous photos. Kerry even managed to get a shot inside the spa which was one of my favorite places. Stay tuned for a blow by blog account of our time on board the Queen Mary 2. Sign up here now for free updates. Cruising on the Queen Mary was a real experience – glad to have shared it with you! I have the same fears and thoughts that you had before your cruise so it was interesting to read. How fabulous that you experienced your first cruise on the Queen Mary 2. Well this is very reassuring. I have similar concerns, however am booked on a 3 night cruise in a couple of weeks. I do hate crowds and queuing, so you’ve soothed my concerns. Lovely photos and I am looking forward to hearing more. Details on the Spa please. I hope you enjoy the cruising life too. There are more spa details coming up in part 2. Oh Annabel, how wonderful. I also have the same fears about cruising and describe the dear folks who take them in not quite such flattering terms as you – but I fear I may be wrong, and the words crowded or geriatric might be a bit harsh – especially when it comes to the Queen Mary! What an elegant lady she is! Looks like you had a fab time, and the whole experience was definitely one to add to the box of travel memories. I certainly wouldn’t have said No either! You know some of the old people I met had been dreaming of a trip on the Queen Mary 2 or a fancy cruise ship all their lives. I was happy they made it! Annabel, it sounds like you had a lovely opportunity and experience! I have looked at cruises a few times as a family trip option but it hasn’t quite eventuated yet. I’d do it with the kids too. It would be a very relaxing family holiday although I did worry slightly that I’d never track my kids down! Indeed not! Gosh that word “pampered” has negative connotations for no reason. Surely everyone deserves to be spoilt rotten from time to time. Liked your create up, Annabel. I had identical issues about the other travelers and was in the same way pleased when I actually talked with them.